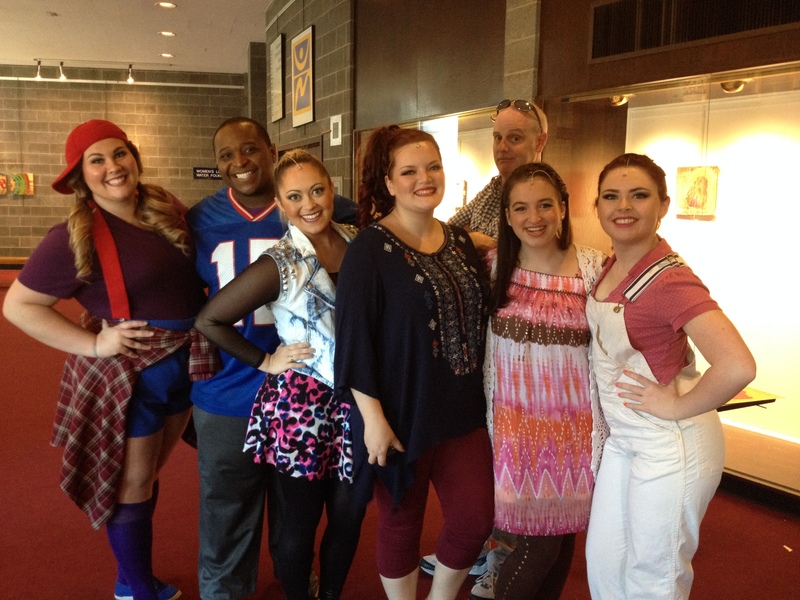 Directed and choreographed by Larry Nye, “Godspell” shines a new light on the parables in the Gospel According to St. Matthew. With the use of creative props and purposeful dance numbers, the show’s talented cast takes the audience on a journey through Jesus’s life and his teachings. It’s not too late to catch the show–the next performances will be on Oct. 17 at 8 p.m. and on Oct. 18 and 19 at 2 p.m. in the Lyman Center. Tickets are free for SCSU students. 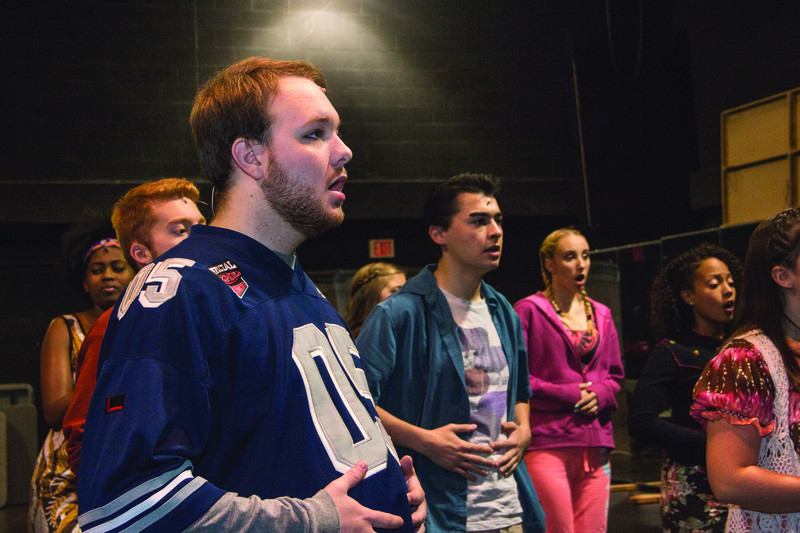 Sophomore communications major, Brandon Bush, played Jesus–and a pretty convincing one at that. He didn’t have the typical long beard and flowy robe, instead the clean-shaven college student was dressed in blue jeans, and a tee shirt resembling the Captain America insignia. His tall stature helped distinguish him from the ensemble and his soft voice rose above the rest. Bush was the perfect fit for the role of a modern Jesus. Also in the cast, freshman Eric Clinton, provided a necessary balance to Jesus’s hand-holding, kumbaya singing harmony. Wearing a black motorcycle vest with a flaming skull on the back, Clinton acts out Judas’s betrayal of Jesus with high energy and emotion. In the second act, at the last supper, when he storms off stage, not a single audience member stirs. The ensemble, however, was the key component of the show. For each scene, each dance number, the 19-person cast gave 100 percent. The level of emotion from each actor was nearly overwhelming. Their energy was carried throughout the entire show without faltering. Rather than just alluding to the stories, the cast reenacts the parables so that those who perhaps are not familiar with the teachings, will understand the concepts. For those who do know the stories, the show reinforces those lessons and moral teachings. The stage design was minimal, but the cast used a number of different–sometimes odd–props to convey their messages and help with the story telling. For one, the prodigal son scene featured Darth Vader and a Mario Brother puppets–with iconic sound effects, both were a crowd favorite. Each ensemble member wore many hats, both literally and metaphorically. To signal a transition of characters, actors wore everything from wigs, to capes to take on the character in the parable. From love to regret, longing to joy, the talented cast in the ensemble successfully portrayed a wide range of emotions. For comic relief, actors exaggerated facial expressions and body movements, but there were moments when the actions were overdone and over dramatic for the scene. The dance numbers were meaningful, and by far the most entertaining. The full cast ensemble numbers were filled with heart, high-energy and brought the stories full circle. The most powerful rally for Jesus songs were “Prepare Ye,” and “Light of the World.” Larry Nye did a great job choreography each number to include every cast member, but to also tie the dance into the parables and lessons from the scene. Apart from the glow-in-the-dark numbers, the colorful face paint and the colloquial translation of the Bible, the most moving parts of the musical were the ones with the least amount of movement. One song in particular, “On the Willows,” a soft, peaceful song, resonates in the theater, long after the curtain falls. Crescent Players Shawn Allen and Kathryn Twohill did an outstanding job singing during this somber scene of Jesus’s crucifixion. For believers and non-believers, religious or not, this musical is entertaining and filled with a talented cast who will leave the audience having to take a deep breath after the lights come up. Reblogged this on Monica Zielinski.